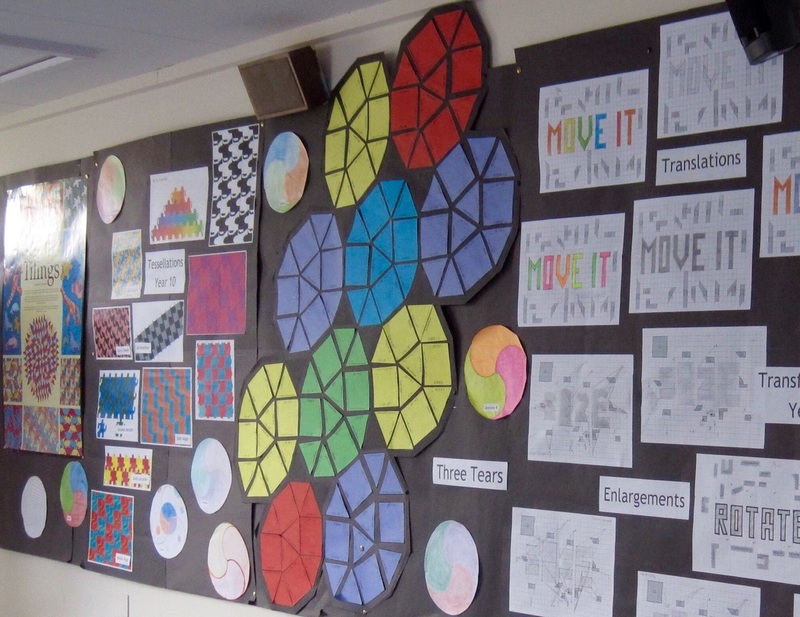 On this page you will find resources and ideas for mathematics classroom displays. 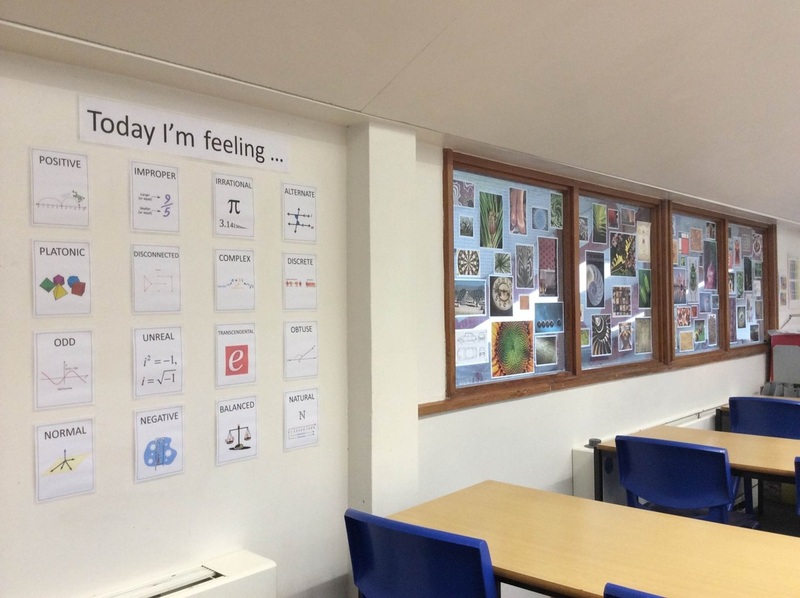 They range from inspiring quotes from famous thinkers, to word walls, growth mindset prompts and displays that brighten up a room whilst simultaneously supporting student learning. I have included photos to give an idea of how the finished displays could look. 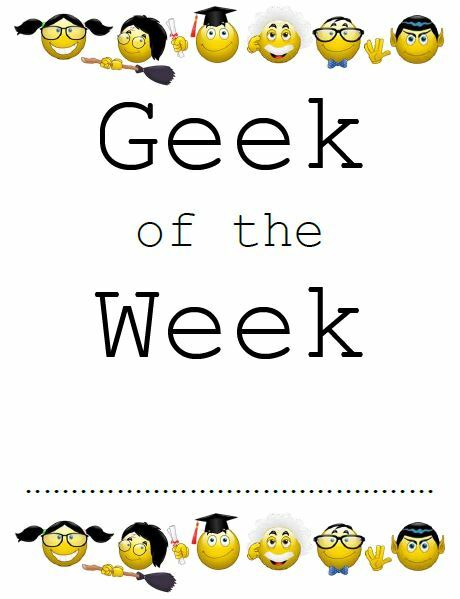 Many of these resources have been inspired by some of the fantastic teachers I follow on Twitter, and where relevant they have been credited. ​There are some important considerations when preparing display resources. Print resources onto brightly coloured paper to add visual interest (much cheaper than printing in colour) and, if laminating, use matt laminating pouches to reduce glare. Where possible, ensure your display boards are backed and bordered, but don't be afraid to let pieces creep over the edge. Two other useful investments which will lend a professional edge to your displays are pre-cut display lettering and mounting paper. And do get some spray mount. Please contact me if you have any questions, or would like editable versions of any of the resources. Your feedback is also welcome. ​Designed to show the processes involved in mastering new mathematical skills and to highlight and encourage the need for resilience. Relevant to, and easily adapted for, many other subjects. The flowchart can also be laid out horizontally. 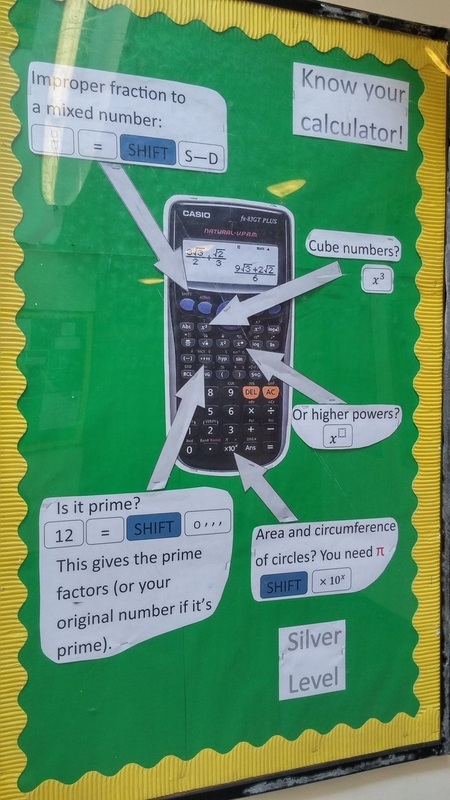 Credit must be given to Kelly O'Shea for the original idea and to Sarah Carter (@mathequalslove) for posting her display on Twitter. Both have kindly allowed me to share my version here. Another great idea pinched from @mathequalslove! A selection of fixed/growth mindset statements presented in speech and thought bubbles. 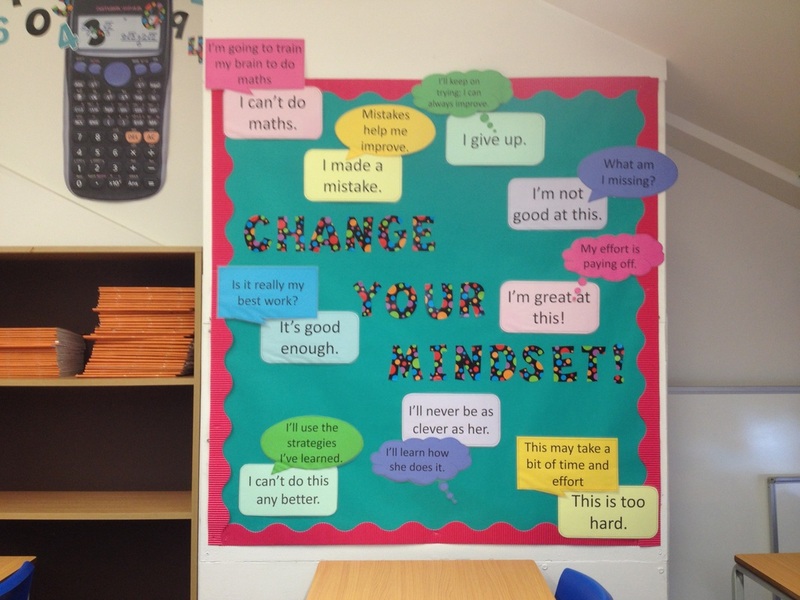 I refer to this display frequently, and my students now use it to remind each other to think positively when stuck or struggling. 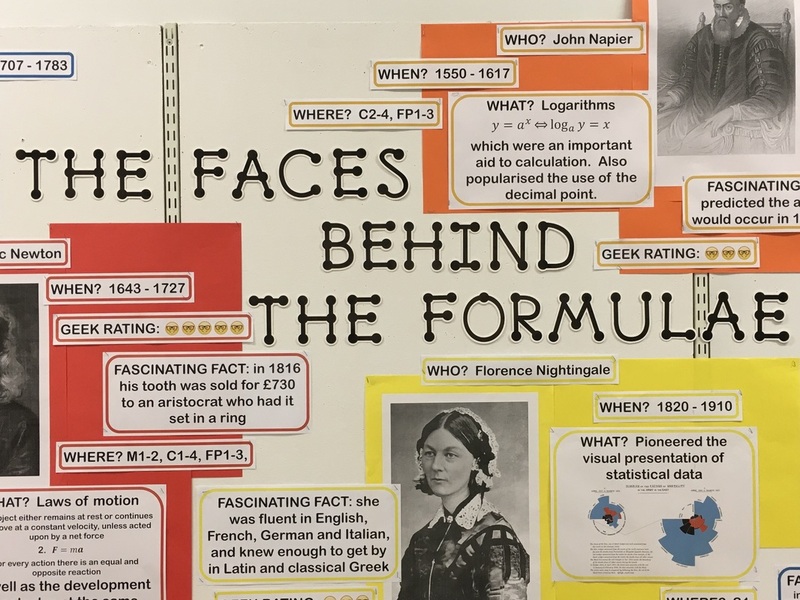 This display is another that can be adapted for most subjects. I love this display; it's bright and cheerful, and my students refer to it all the time. Some have told me that they can now visualise it in their mind's eye and recall the common squares and cubes - exactly what I hoped for when I made it! I used numbers and letters from a pre-cut lettering pack, but it would be easy enough to design and cut out your own, or use the many printable versions freely available on the web. 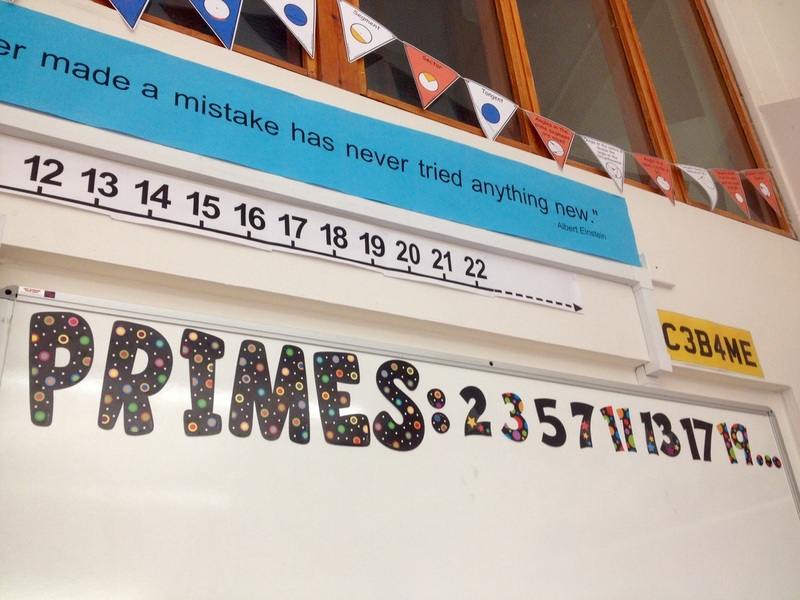 The squares and cubes display has been so successful that I have now made a prime numbers display along the top of my whiteboard (the unused bit that I can't reach!). 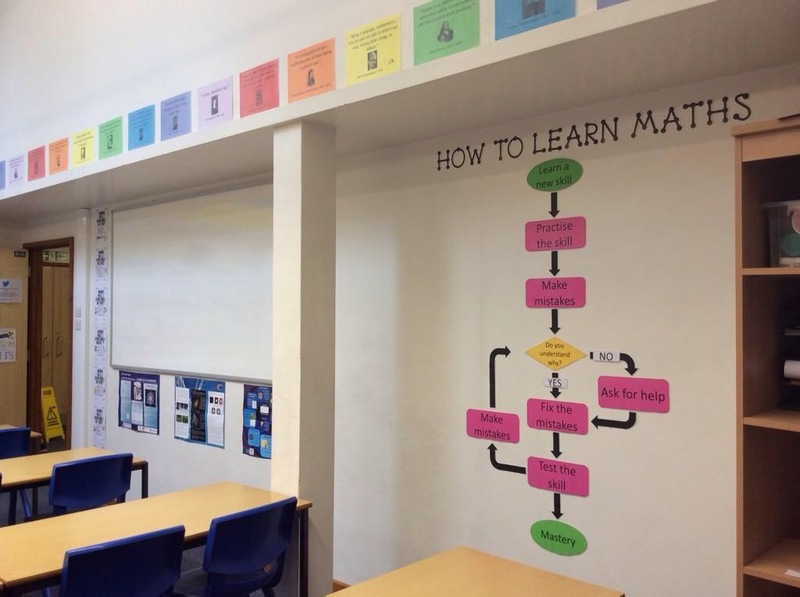 Also note the handy formula and shape bunting above the board, made by Danielle Bartram (@MissBsResources) and Paul Collins (@mrprcollins), and available here. 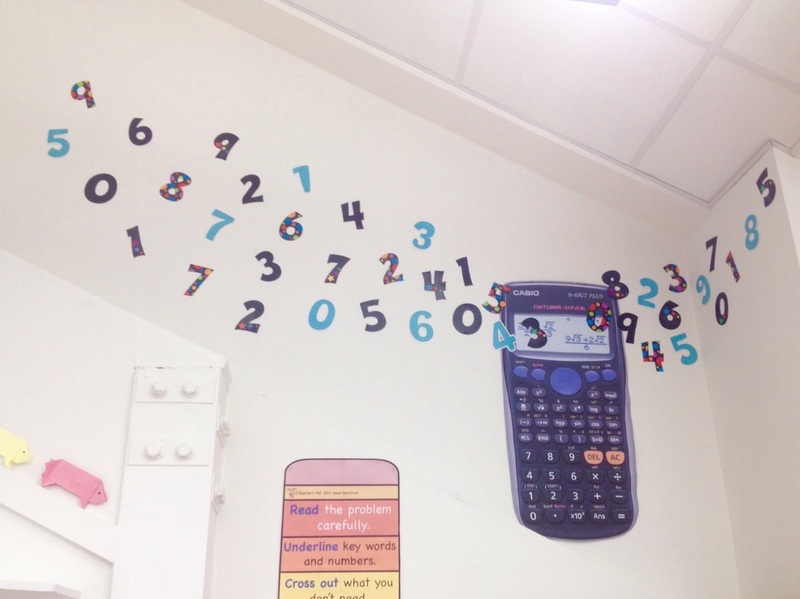 And Mel Muldowney (@Just_Maths) has also done some fab keyword bunting. 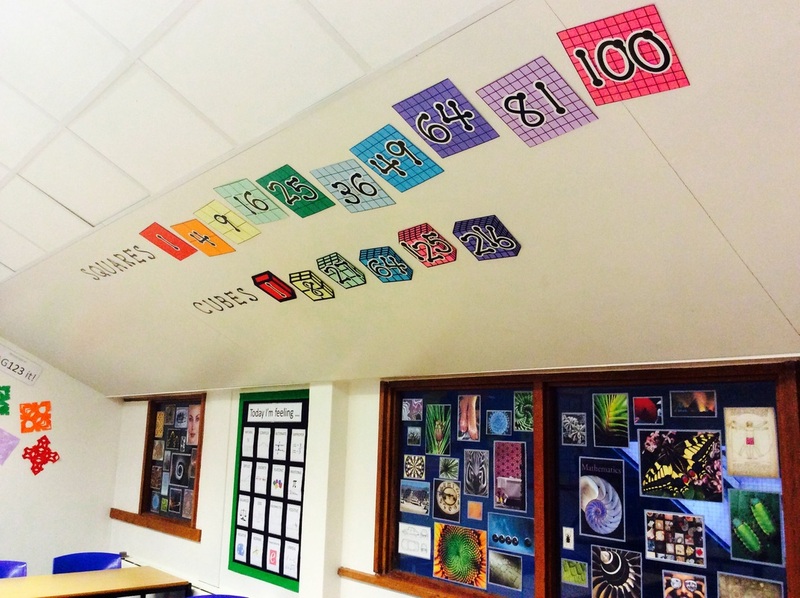 This display adds some historical interest and can be used to create a bright border around the classroom. 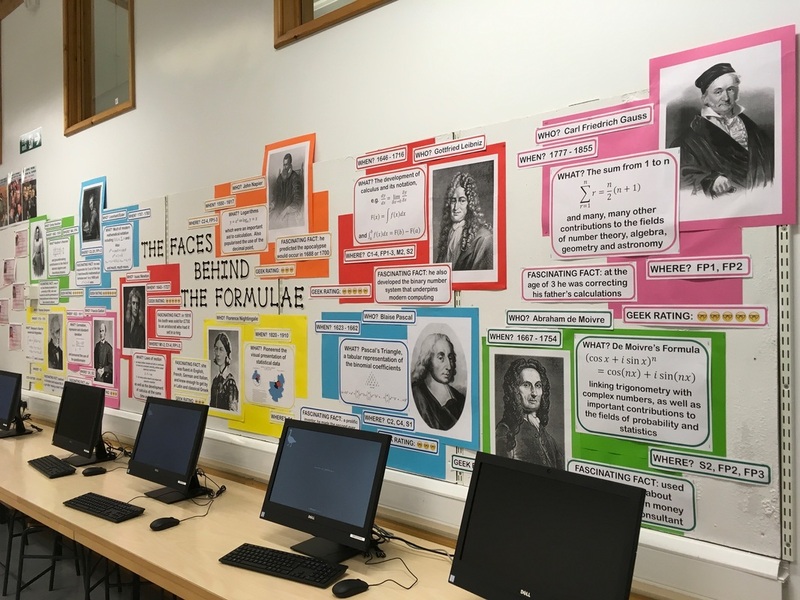 Quotes include Hypatia of Alexandria: "Reserve your right to think, for even to think wrongly is better than not to think at all", Sir Isaac Newton: "If I have been able to see further, it was only because I stood on the shoulders of giants", and Marie Curie: "Be less curious about people and more curious about ideas". 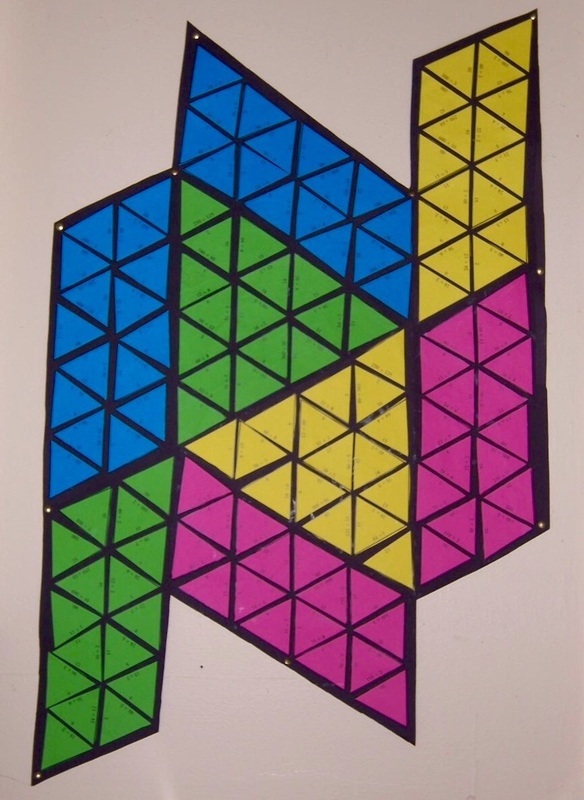 Next time you do a Tarsia puzzle with your students, print it out on coloured paper. When students have cut out and completed the puzzle, get them to stick it down onto sugar paper, leaving a half to 1 cm gap between the pieces to highlight the structure. 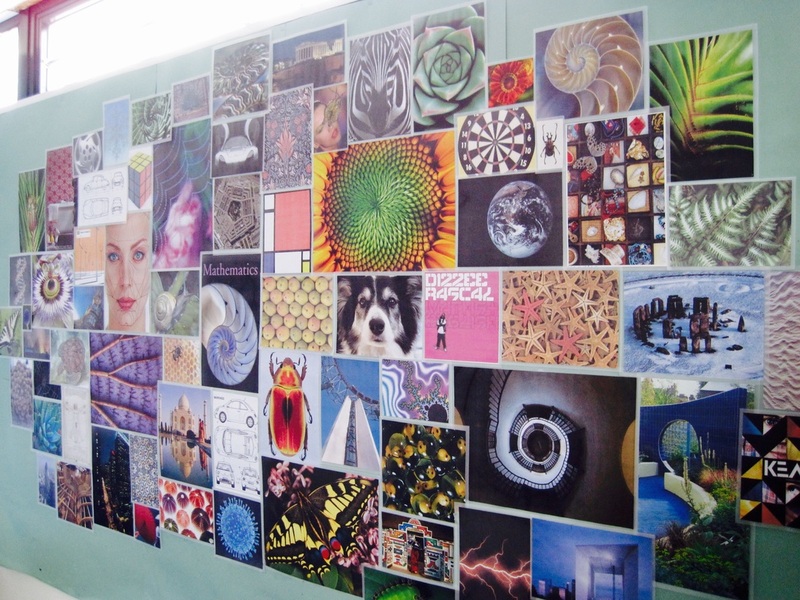 The puzzles can then be tessellated in different ways. A poster I made for a slightly tongue-in-cheek competition that I have run in the past with my A Level groups. They loved it and it has featured in many a student selfie! Students in lower year groups are always intrigued by it, and I like that it promotes a positive view of hard work and academic attainment. I'll definitely be using it again next year. Best printed onto A3 paper and then laminated (with a glossy pouch) so that it can be written on with board marker and wiped clean. I got this lovely idea from Emma Bell (@El_Timbre) who posted a picture of her version on Twitter. At my school we displayed it in the corridor and ran it as a mini competition. Great for reinforcing mathematical vocabulary and (ironically) correct spelling. One of the most frustrating situations I encounter in my classroom is when students are too scared to 'have a go' in case they make a mistake. 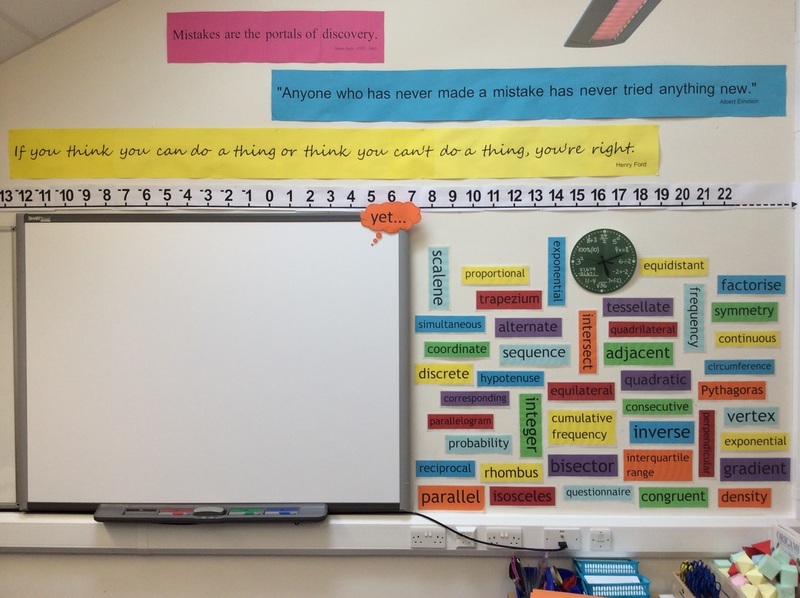 I made these giant 'mistakes quotes' to help create a classroom culture where mistakes are seen as simply part of the problem-solving process. 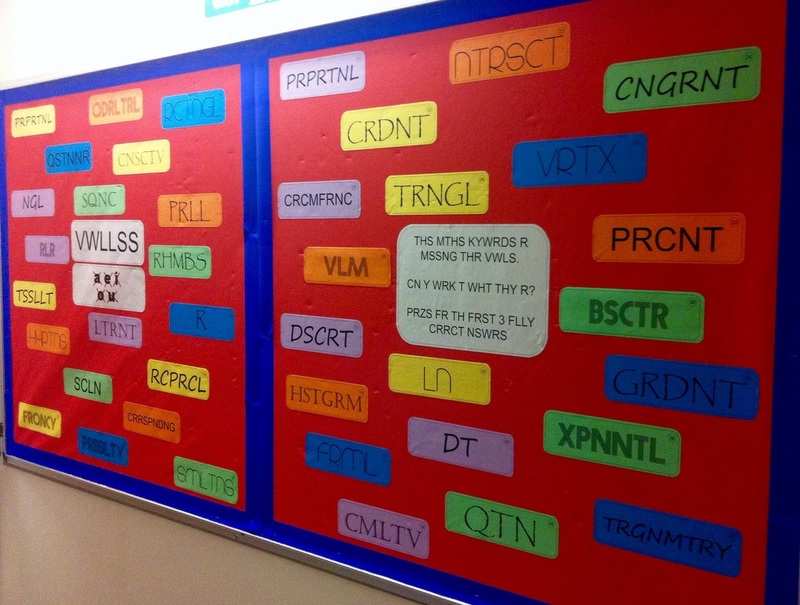 A colourful vocabulary display, useful for reinforcing spelling and pronunciation, and for quizzing students on their knowledge. 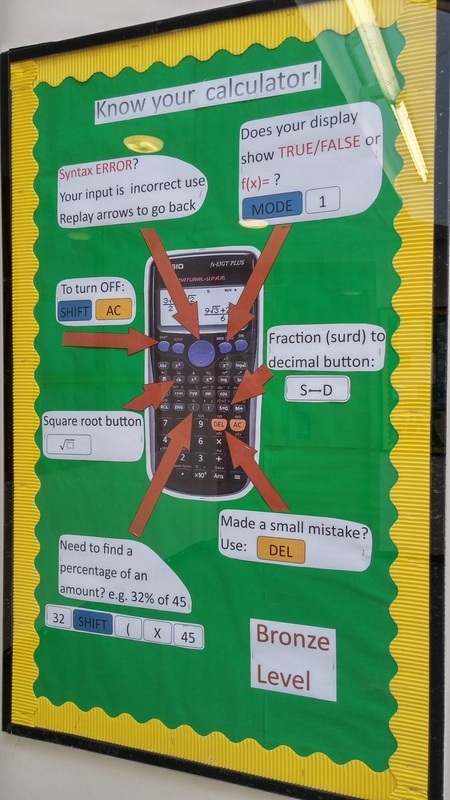 I saw a brilliant hand-drawn version of this quirky and witty display idea by Ed Southall (@solvemymaths) and immediately had to make one for my classroom. It's generated a fair few questions from students and some nice class discussion. This display is another one that provides a lot of stimulus for class discussion. I wanted to highlight the degree to which mathematics is simply everywhere: in Nature's symmetries and structures, in our built environment and in the products we all consume. I cut out pictures from magazines and printed off images from the internet, then laminated them (using matt pouches). 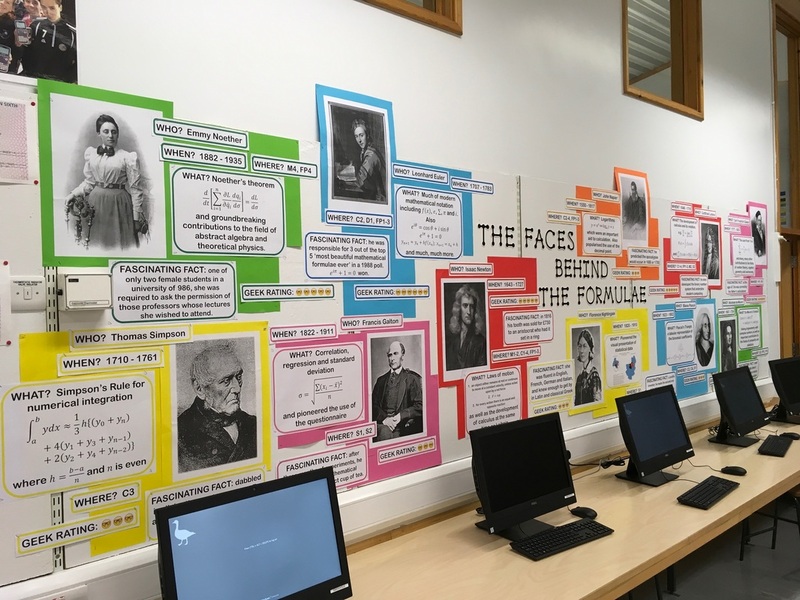 This was a little time consuming, but I now have a beautiful display resource that celebrates the beauty of mathematics and will last me the course of my career. A selection of images (all labelled for noncommercial reuse). 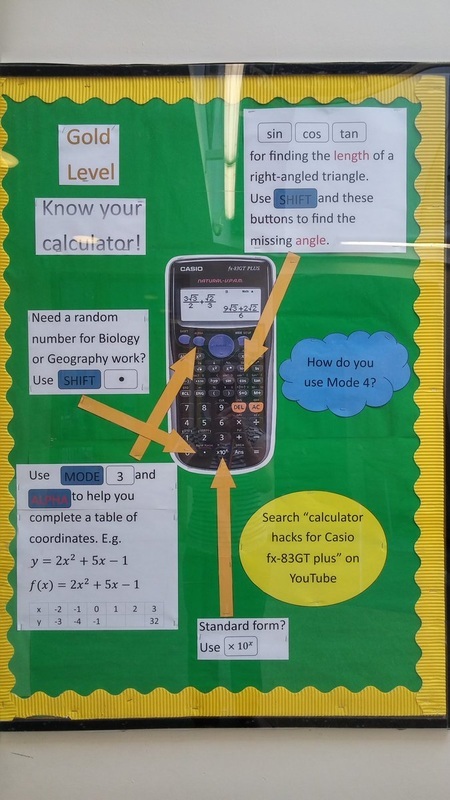 Update: Paula Hughes (@teafairy79) has kindly shared the Bronze, Silver and Gold Calculator Skills displays she made using the Giant Calculator image above. This excellent display is much more functional and informative than mine! I printed all resources A3-sized, and used A3+ mounting paper to create a colourful background. I hope you have found something here to brighten your classroom, stimulate your students' interest and support their learning, and save you some much needed time. I will continue to add resources and ideas as they come. 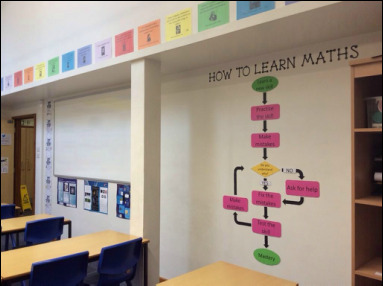 Next year I will be specialising in teaching Key Stage 5 (ages 16-18) only, so watch this space for some A Level maths display ideas!